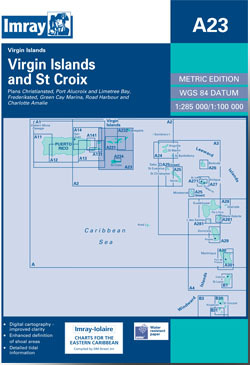 St Croix in the US Virgin Islands (Scale: 1 : 101.400) plus general chart of the Virgin Islands (Scale: 1 : 280,600). Larger scale plans of Green Cay Marina, Frederiksted, Christiansted, Port Alucroix and Limetree Bay. Flat chart, water-resistant paper. 2013 Edition - Fully updated throughout using the latest available information. Various harbour developments on St Croix and at Road Harbour (Tortola) are shown.